Below is a series of 3rd cycle Lesser Black-backeds summering on the East Coast of the United States (Delaware and New Jersey). Most have renewed at least the first five primaries with limited secondary molt. All were photographed between 04-07 August of this year, 2012. The overwhelming majority of summering Lessers in the United States are 2nd and 3rd cycle individuals (full adults are actually pretty uncommon in the summer). By this time next month, adults will start to trickle in as they presumably abandon their breeding territories. The fact that adults are mostly gone during the summer season, but present in the winter, reinforces the suspicion that there is a reoccuring population of northern breeders in N.A. Gulls never seize to amaze me. Besides the incredible amount of variation found on the species level, there are enough aberrations to be found in almost any flock of your most common species. Juvenile American Herring Gull. Chicago, IL. 15 August 2012. I'm not really sure what this is caused by. The closest thing I could relate it to is a fault bar, but not exactly. Juvenile American Herring Gulls have been out and about for a couple of weeks now on the Chicago lakefront. 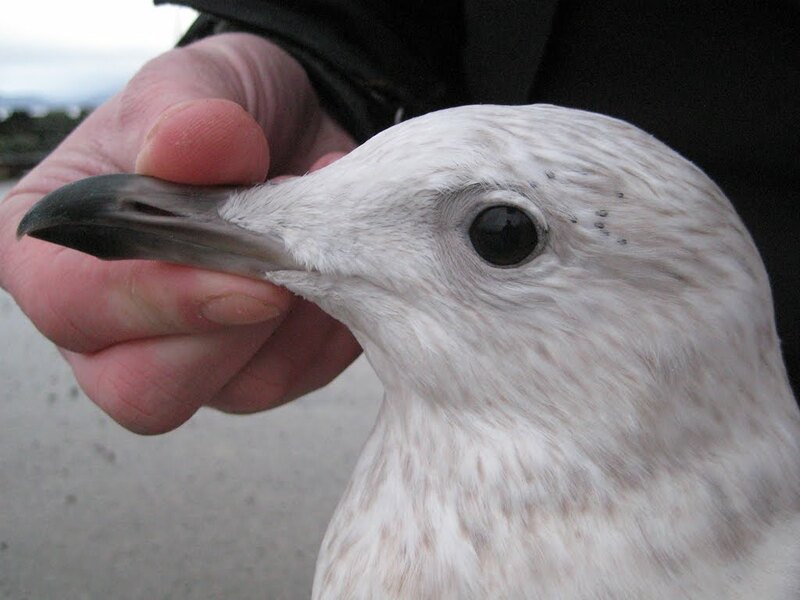 This species is our only other summering gull, found in much smaller numbers than Ring-billeds. Louse Spots: A Sign of Poor Health? Gulls, and birds in general, are known to host a tremendous amount of ectoparasites that generally have a negative effect on feathers and fitness. Preening is just one of the obvious day-to-day activities that birds engage in to combat these parasites. Note the dark spots on the lower cheek. This region is impossible to preen, hence the need for scratching. Some amounts of lice are generally tolerable and not detrimental to a bird's health unless an unusual infestation occurs. An unmanageable "load" is usually a secondary consequence of much more serious health problems. That is, a bird that's unable to control its louse problem is probably suffering from malnourishment, stress and/or disease. The Black-legged Kittiwake pictured below spent several weeks at Montrose Harbor in Chicago early last year. It shows louse spots that were overlooked when I photographed it. Indeed, this bird was in trouble at the time (click here for that story) and it ended up dying shortly after being picked up on 31 March 2011. 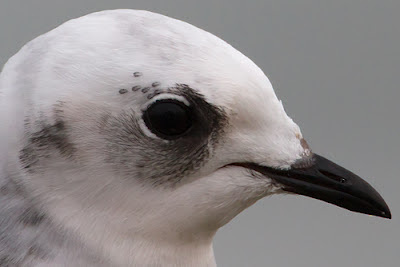 Juvenile Black-legged Kittiwake. Chicago, IL; 31 March 2011. Photo by Amar Ayyash. Note the dark gray spots above the back of the eye. I think my evaluation of this bird's health would have been better informed had I known more about these spots when I first observed it earlier that month. This is not to say the cause of death was lice, but these spots should serve as fitness indicators to the field observer, especially when found on lingering individuals that are out-of-place. Adult Slaty-backed Gull. Grand Marais, MN; 22 July 2006. Photo courtesy of Laura Erickson. I recently inquired about this bird after finding its photos online and was not at all surprised to learn that it was found dead on 14 August 2006. It lingered for over 3 weeks and was unusually tame (very similar to the Black-legged Kittiwake's story). Again, these spots could have served as an obvious red flag regarding its condition. It's this message that I hope my readers take from this post. Juvenile Ross's Gull. Björnhuvudet, Öckerö; 25 December 2011. Juvenile Iceland Gull. Osøyro, Norway; 01 January 2012. Interestingly, all 8 of the gulls that I've personally observed with louse spots have been 1st cycle birds (the number of online photos of juveniles with lice spots also reflects my experience). A provisional conjecture of mine is that "fully" fledged juveniles have less of an advantage at combating these lice, possibly due to an absence of allopreening. Although, this doesn't answer why I haven't seen any intermediate-aged birds (2nd-3rd cycles) with lice spots - they don't regularly engage in allopreening. Perhaps having been afforded an opportunity to molt is also advantageous? Also, fully fledged juveniles may have just recently acquired their lice on the nest (not very uncommon to come into various parasites while flightless). Being in their first year of life, 1st cycle birds may lack the experience to deal with these parasites. More to come on this later. A special thanks to Jason Weckstein, an ornithologist at Chicago's Field Museum, who provided me with engaging information on this subject. Weckstein was able to confirm for me that the spots on the GBBG and BLKI are indeed louse spots, and are very likely of the genus Saemundssonia (living specifically on the head and neck of birds). Let's face it, summer gulls are not very attractive as most are undergoing their complete molts. Both body and flight feathers are a mess, it's hot outside, and the birds look miserable! This can be a total turnoff unless you're fascinated by molt timings. BUT, there's always juveniles to be enjoyed - they're downright gorgeous! American Herring Gull. Chicago, IL; 02 August 2012. 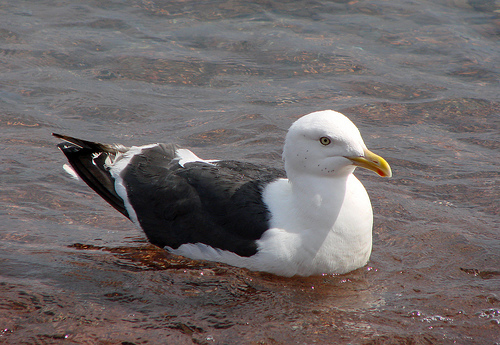 Great Black-backed Gull. Cape May, NJ; 06 August 2012. Ring-billed Gull. Chicago, IL; 28 June 2012. Laughing Gull. Milford, DE; 05 August 2012.